This week my cell phone chirped as I sat in my office finishing up some paperwork. It was M. She called to report that we were nearly out of all-purpose flour and she wanted to make zucchini bread. A co-worker had brought in a few beautiful zucchini and laid them on the lunch table announcing she had harvested way too many zucchini and we should take whatever we might use. Naturally, I snatched up the largest I could find as I love to bake zucchini bread and freeze it through the winter months. Reporting back to M, I asked her to look through my file of old recipes kept in the kitchen desk, to find a quick bread recipe that would use only the ingredients she had on hand. To my delight, when I returned home from work, M had made oodles of muffins and quick breads to share with the family. She had used up most of the overly ripe fruit and veggies that she found on the counter top and in the crisper drawer. M’s a resourceful child and it makes her happy to turn to baking to relax and enjoy time on her hands for the summer. It won’t be long before the school bell rings and the race begins all over again. I’m glad she has found a relaxing hobby as she follows in her mother’s footsteps. Preheat oven to 350 degrees and grease a (9x5x2 3/4″) loaf pan. In a large bowl, combine eggs, oil, sugars, zucchini, and vanilla. Mix well. Add flours, baking powder, soda, salt, wheat germ, and cinnamon; stir to combine. Stir in nuts. Pour batter into prepared pan. Sprinkle a teaspoon of wheat germ over the batter. Bake for 55-60 minutes, or until a tester inserted in the center comes out clean. Sounds wonderful! I wonder if it would work in a breadmaker – would need to reduce the liquid I think. I don’t have an oven so tried out an adaptation of the recipe for my breadmaker. It was too moist though, so I will have to tinker with the ingredients some more to get a firmer loaf. One day, I will either get my oven fixed or get a new one! Oh, I see your dilemma…yes, this loaf would probably be too moist for the bread machine. You might try searching for a bread machine zucchini recipe and combine the two recipes using the bread machine recipe as a guide. All the best to you! Sounds delicious. I love baking with veggies. 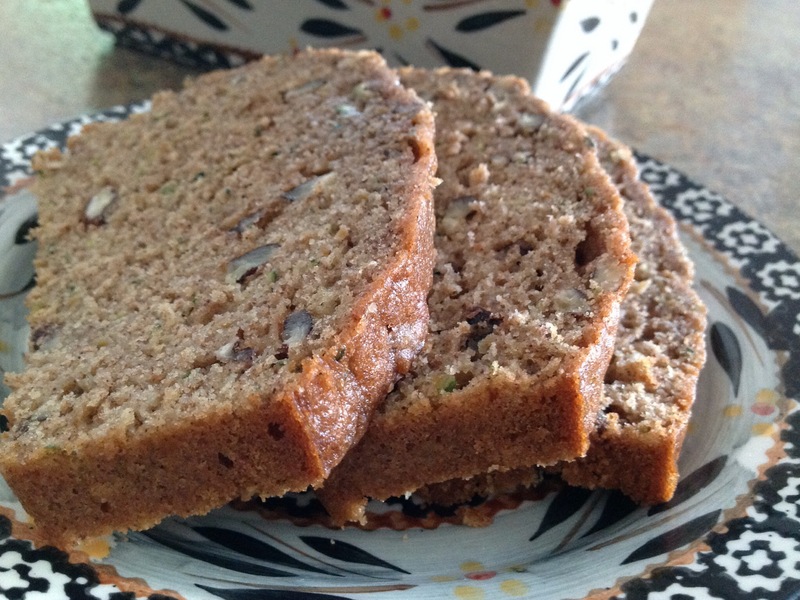 Zucchini, carrot, and banana breads are some of my favorite quick bread flavors. The veggies and whole grains add to the moist texture and hearty flavor of the bread. Thank you so much for your valued comment! I love zucchini bread, just discovered it a few months ago and cannot get enough now. So delicious. Living in the Midwestern part of the United States, it’s zucchini season! This is a great way to use up the crop. I like to put them in the food processor and pulse them until they are shredded. Then I put 2 cups of the zucchini in freezer bags to save for bread making during the winter months. Glad I found this.! Just this morning, I grated zucchini and put it in freezer bags in two cup increments. Stuffed them in the freezer to make zucchini bread at a later date! Oh my goodness, that’s exactly what I do! It’s so convenient to take a bag out of the freezer and quickly whip up a loaf or two of quick bread! Thanks for the reminder and thanks for your valued comment!